Policies on comprehensive internationalisation are currently in the focus of discourses on the development of internationalisation in European higher education. However, it remains to be answered, whether in Slovenian higher education, internationalisation policies and practices are indeed being implemented consistently and comprehensively, contributing to the overall quality of the higher education system. The paper obtains answers to this question through the analysis of different documentary sources and findings from semi-structured interviews, which were conducted as part of the PhD research. Firstly, it provides a general overview of the Slovenian higher education system, whilst afterwards, it explores the comprehensiveness of internationalisation in Slovenian higher education through the analysis of internationalisation policies before and after the Bologna Process. 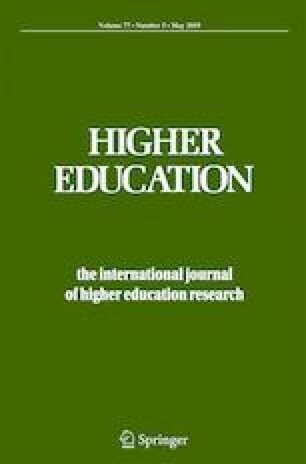 Based on the distinction between the ‘abroad’ and ‘at home’ dimension of internationalisation in higher education (Knight 2008), it continues with the examination of trends in mobility and internationalisation at home, which represent essential parts of comprehensive internationalisation policies and strategies. On this basis, it discusses the real importance of internationalisation for the quality of (Slovenian) higher education and concludes that the existence of different internationalisation models results from diverse approaches and rationales for internationalisation and hence, from often-contrasting views of individual actors and stakeholders on what is the quality of higher education and its (comprehensive) internationalisation. Bologna Declaration (1999). http://archive-2010-2015.ehea.info/article-details.aspx?ArticleId=80. Accessed 3 Oct 2017. EAIE. (2015). The EAIE Barometer: internationalisation in Europe, executive summary. https://www.eaie.org/community/projects-advocacy/barometer.html. Accessed 12 May 2018. European Commission (2013). European higher education in the World. https://ec.europa.eu/education/policy/international-cooperation/world-education_en. Accessed 2 Nov 2017. Evidenca visokošolskih zavodov in študijskih programov (2018). [Public registry of higher education institutions and study programmes 2018]. http://www.stat.si/StatWeb/en/News/Index/6665. Accessed 28 Apr 2018. Hauptman Komotar, M. (2018). Quality assurance of internationalisation and internationalisation of quality assurance in Slovenian and Dutch higher education. European Journal of Higher Education. https://doi.org/10.1080/21568235.2018.1458635. Javna evidenca visokošolskega transnacionalnega izobraževanja 2017. [Public registry of transnational higher education 2017]. http://www.nakvis.si/sl-SI/Content/Details/46. Accessed 25 Apr 2018. Leuven Communiqué (2009). http://archive-2010-2015.ehea.info/article-details.aspx?ArticleId=80. Accessed 9 Nov 2017. Ministry of Education, Science and Sport (2016a). Strategy for the internationalisation of Slovenian higher education 2016–2020. http://www.mizs.gov.si/si/delovna_podrocja/direktorat_za_visoko_solstvo/sektor_za_visoko_solstvo/internacionalizacija_vs/. Accessed 3 Dec 2017. Ministry of Education, Science and Sport (2016b). Pregled stanja v slovenskem visokem šolstvu na področju internacionalizacije [Overview on the state of Slovenian higher education in the field of Internationalisation]. http://www.mizs.gov.si/si/delovna_podrocja/direktorat_za_visoko_solstvo/sektor_za_visok o_solstvo/internacionalizacija_vs/. Accessed 2 Dec 2017. Ministry of Education, Science and Sport (2016c). Action plan strategy for the internationalisation of Slovenian higher education 2016–2018: collected objectives, measures, indicators, responsibilities with a time plan. http://www.mizs.gov.si/si/delovna_podrocja/direktorat_za_visoko_solstvo/sektor_za_visoko_solstvo/internacionalizacija_vs/. Accessed 3 Dec 2017. Ministry of Education, Science and Sport (2018). List of study programmes delivered in English for the 2018/19 academic year. http://www.mizs.gov.si/en/areas_of_work/directorate_of_higher_education/higher_education_system_in_slovenia/. Accessed 30 July 2018. Nacionalni program visokega šolstva (2002). [National higher education programme 2002]. http://www.pisrs.si/Pis.web/pregledPredpisa?id=NACP33. Accessed 3 Nov 2017. Resolucija o nacionalnem programu visokega šolstva (2007–2010) [Resolution on the national higher education programme 2007–2010]. http://www.pisrs.si/Pis.web/pregledPredpisa?id=ZAKO4295. Accessed 3 Oct 2017. Resolucija o nacionalnem programu visokega šolstva (2011–2020) [Resolution on the national higher education programme 2011–2020]. http://www.drznaslovenija.mvzt.gov.si/ch01.html. Accessed 6 Dec 2017. Statistical Office of the Republic of Slovenia (2018). The number of tertiary education students continues to fall; in 2017/18 it was again lower than a year earlier. http://www.stat.si/StatWeb/en/News/Index/7433. Accessed 23 July 2018. UNESCO Institute for Statistics (2018). Global flow of tertiary-level students. http://uis.unesco.org/en/uis-student-flow. Accessed 15 May 2018. University of Ljubljana (2014). Strategija internacionalizacije Univerze v Ljubljani 2014–2017 (2020) [Internationalisation strategy of the University of Ljubljana 2014–2017(2020)]. https://www.uni-lj.si/o_univerzi_v_ljubljani/strategija_ul/. Accessed 15 Nov 2017. University of Maribor (2013). Development strategy of the University of Maribor 2013–2020. https://www.um.si/en/about/mission.../Strategija%20UM%202013-2020_ang.pdf. Accessed 19 Dec 2017. University of Primorska (2014). Srednjeročna razvojna strategija Univerze na Primorskem 2014–2020 [The medium-term development strategy of the University of Primorska 2014–2020]. http://www.upr.si/index.php?page=static&item=82. Accessed 8 Dec 2017. Working Group on Mobility (2012). Mobility for better learning: mobility strategy 2020 for the European Higher Education Area (EHEA). https://www.ehea.info/cid101043/ministerial-conference-bucharest-2012.html. Accessed 15 Mar 2018. Yerevan Communiqué. (2015). https://www.ehea.info/pid34363/ministerial-declarations-and-communiques.html. Accessed 13 Nov 2017.